Yellow: two MVCs- one for sequence and envelope triggering, the other for pitch. If set to different Midi channels, pitch can be altered while a sequence is running. Green: four sequencers - Gate, Note, Unipolar and Bipolar control. Blue: Adsr and Ad envelopes, triggered by the Gate Sequencer. MultiLfo can be triggered by (Trigger) MVC, or GateSeq, or can be free-running. Red: Synth parameters. Two OSCs with xFade, Distortion1, Filter, Distortion2, Modulation VCA, EndVCA with EQ, Pan, FxFeed, InsertFx. - can played like a 'normal' synth by choosing 'No Modulation' in the ModVCA section. In this case the EndVCA envelope alone is in charge for volume modulation. - instead of the Bpm clock, a Frequency knob can determine the tempo. - all parameters which can be modulated by seuencers have bluish textfields; connected modulation targets are displayed as lit LEDs near modulation sources. - FxFeed can provide that only specified portions of a sequence are processed by InsertFx devices. - EndVCA/AdsrEnv<->FreeRun: By choosing FreeRun the sequencer runs forever w/o intervention. - Polyphony (No of Voices, top right): depends on available Dsps. Some parts of the device are located on the same dsp chip. 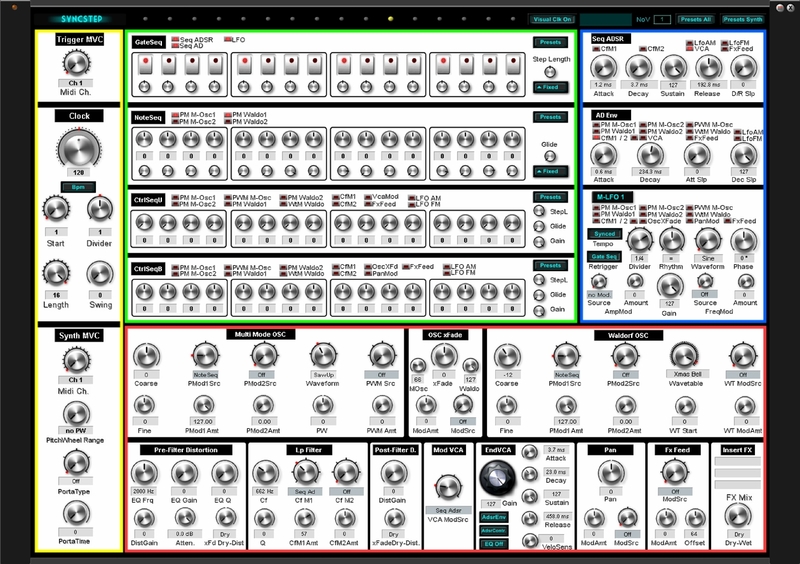 - Various Preset Lists for Sequencers, and Synth parameters.